The the most obvious method of adding a new request is clicking this button located on the bottom center of the middle panel in the Dashboard. Clicking it will pop up a new Request form. You must provide the information required in the fields or controls marked with a red asterisk. 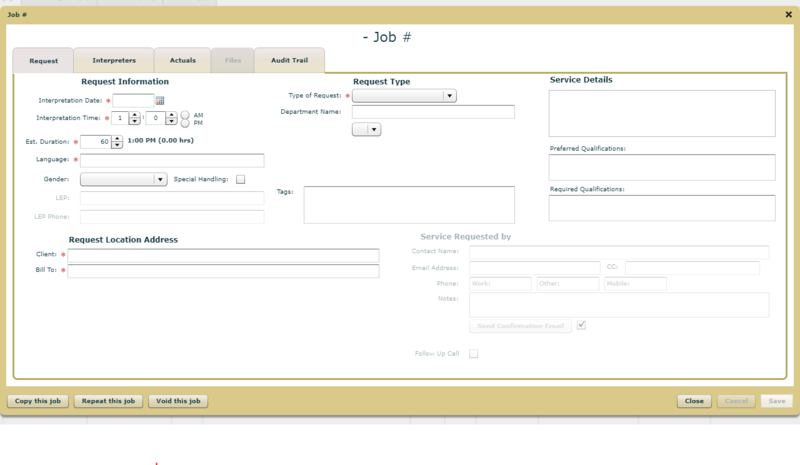 You can also fill in any of the other fields for which you have the information and want to have available for this request. Once you have done this, clicking the Save button in the lower right corner of the Request form pop-up will add this new Request to the database. Once you have saved the Request, you are free to close the pop up using the Close button. You are also ready to move to the Interpreter tab of the request. You can see other articles discussing that option. Of course, if you changed your mind and do not want to save the request, you can cancel/close without saving.